She is one of the most famous and controversial figures in Scottish history. Now Mary Queen of Scots is about to be cast in a new light in an exhibition depicting her at various points throughout her turbulent life. Glasgow-based artist Helen Flockhart has created 17 oil paintings inspired by the enigmatic monarch. She has spent a year creating the works for a show which is due to open in Edinburgh next month before relocating to Linlithgow, the town of Mary’s birth. 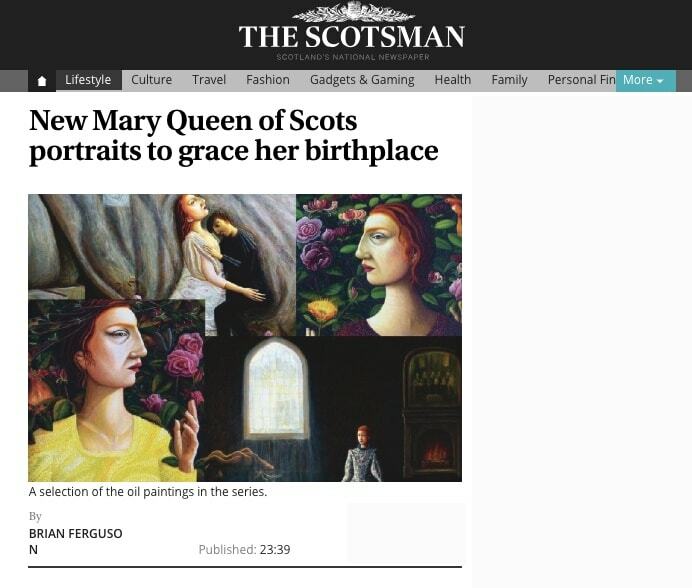 It is believed to be the first major exhibition of new artworks dedicated to Mary Queen of Scots for decades. Mary reigned from 1542, when her father King James V died when she was just six days old, until her forced abdication in 1567. After 19 years as a prisoner of her cousin, Elizabeth I of England, Mary was executed on 8 February 1587 for allegedly plotting against her royal rival. Flockhart’s exhibition will be unveiled at the Arusha Gallery in Edinburgh on 13 September – just four months before a blockbuster movie, Mary Queen of Scots, which will see Saoirse Ronan and Margot Robbie battle it out as Mary and Elizabeth, is due to arrive in cinemas. 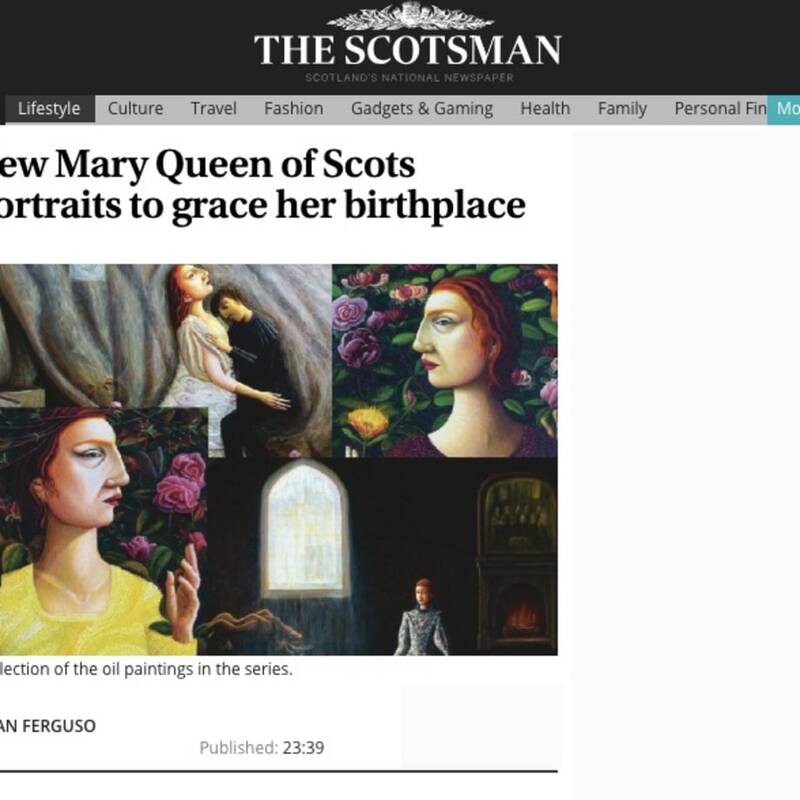 Flockhart, a graduate of Glasgow School of Art, insists the timing is a complete coincidence, despite acknowledging a new-found interest in Mary Queen of Scots was only sparked after being asked to exhibit work in Linlithgow Burgh Halls, which will show her new paintings later this year. Flockhart said: “When I went out to see Linlithgow Burgh Halls I went in to see the palace, which is right next door, and I was just amazed by it. At that point I’d never painted Mary Queen of Scots before and had never really looked into her story much. “I thought it might be quite good to do a painting for the show, which led to another and another. “I ended up doing a whole load of work and there are going to be 17 in the show, which for me is a lot of work, because I build up my paintings in layers. I’ve worked on it tirelessly since last August. As well as Linlithgow Palace, Flockhart visited other sites linked to Mary, including the Palace of Holyroodhouse and Blair Castle. She added: “I just started to wonder why I didn’t know more about her. I was taught nothing about Mary Queen of Scots at school but she was a fascinating figure at an amazing time in history to be a female leader when the Scottish Reformation was going on. “You can also see a direct line constitutionally from what went on in the 16th century to what is going on today. “The way her gender seemed to affect the events in her life just felt so interesting and relevant to me. The exhibition shows Mary when she was five years old and recently arrived in France, her 1558 wedding to Francis, the Dauphin of France, and when she was widowed at 18 when Francis died of an ear infection. The painting entitled The Mermaid and the Hare explores the scandal that unfolded after the murder of her second husband, Lord Darnley, and her subsequent marriage to the chief suspect, the Earl of Bothwell. Flockhart added: “After the murder of Darnley, placards were put up around Edinburgh depicting Mary as a mermaid (a 16th-century symbol for a prostitute) holding a sea anemone and a net, and a hare (Bothwell’s family crest) after rumours circulated about her relationship with him and their involvement in Darnley’s murder.